The regularity and richness of the annual Nile River flood, coupled with semi-isolation provided by deserts to the east and west, allowed for the development of one of the world's great civilizations. A unified kingdom arose circa 3200 B.C., and a series of dynasties ruled in Egypt for the next three millennia. The last native dynasty fell to the Persians in 341 B.C., who in turn were replaced by the Greeks, Romans, and Byzantines. It was the Arabs who introduced Islam and the Arabic language in the 7th century and who ruled for the next six centuries. A local military caste, the Mamluks took control about 1250 and continued to govern after the conquest of Egypt by the Ottoman Turks in 1517. Completion of the Suez Canal in 1869 elevated Egypt as an important world transportation hub. Ostensibly to protect its investments, Britain seized control of Egypt's government in 1882, but nominal allegiance to the Ottoman Empire continued until 1914. Partially independent from the UK in 1922, Egypt acquired full sovereignty from Britain in 1952. The completion of the Aswan High Dam in 1971 and the resultant Lake Nasser have altered the time-honored place of the Nile River in the agriculture and ecology of Egypt. A rapidly growing population (the largest in the Arab world), limited arable land, and dependence on the Nile all continue to overtax resources and stress society. The government has struggled to meet the demands of Egypt's population through economic reform and massive investment in communications and physical infrastructure. 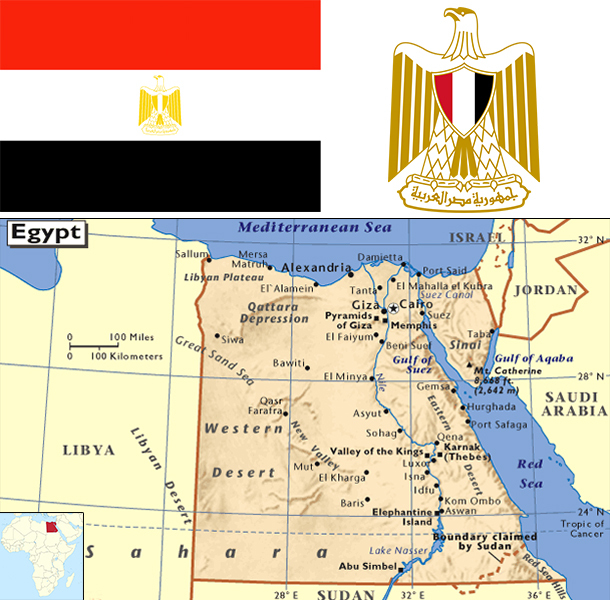 Occupying the northeast corner of the African continent, Egypt is bisected by the highly fertile Nile valley, where most economic activity takes place. Egypt's economy was highly centralized during the rule of former President Gamal Abdel NASSER but opened up considerably under former Presidents Anwar EL-SADAT and Mohamed Hosni MUBARAK. Cairo from 2004 to 2008 pursued business climate reforms to attract foreign investment and facilitate growth. Poor living conditions and limited job opportunities for the average Egyptian contribute to public discontent, a major factor leading to the January 2011 revolution that ousted Mubarak. The uncertain political, security, and policy environment since 2011 caused economic growth to slow significantly, hurting tourism, manufacturing, and other sectors and pushing up unemployment. Weak growth and limited foreign exchange earnings have made public finances unsustainable, leaving authorities dependent on expensive borrowing for deficit finance and on Gulf allies to help cover the import bill. Egypt's current Constitution passed in a referendum that took place in January 2014.